Planetary gearboxes - descriptions, photos and technical specifications, global manufacturers. Send inquiries to the manufacturers and contact them directly. 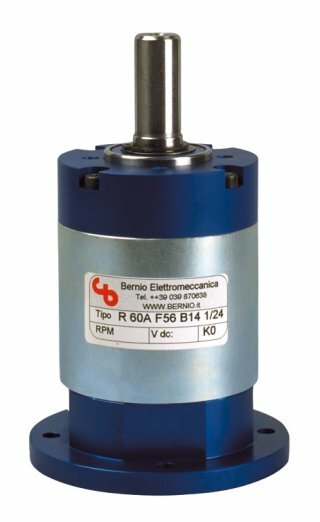 Epicicloidal reduction gearbox model R80 63 B 14 with a galvanized steel delrin and frame , hardned steel and brass gear; outlet shaft supported with 2 ball bearings with speed 3000 RPM at the reduction gear (4000 R.P.M maximum speed). Gearbox may be connected with 63 B 14 output motors. Max forces: 50 kg(Axial), 60 kg(Radial). Model: R80 63 B 14 permanent greasing. Epicicloidal reduction gearbox with a galvanized steel frame and delrin, brass, hardned steel gear; outlet shaft supported by 2 ballbearings with max speed 4000RPM at the reduction gear, but advised speed 3000RPM. Is possible to join with 56B14 motor. Max forces which may act Model: R60 56 B 14 outlet shaft: Radial 40kg, Axial 30kg. 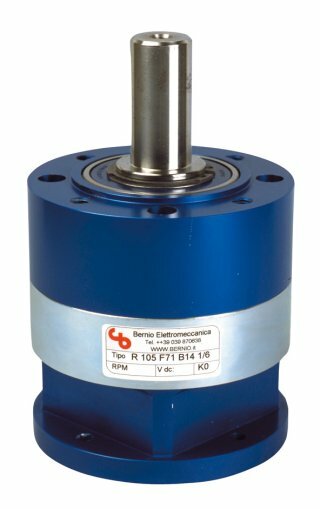 Epicicloidal reduction gearbox model R105 71 B 14 with a galvanized steel frame, delrin, brass, hardned steel gear; outlet shaft of model R105 71 B 14 supported by 2 ballbearings with maximal speed 3000RPM at the reduction gear, but advised speed 2500RPM. Is possible to join with 71B14 output motor. Max forces which may act Model: R105 71 B 14 outlet shaft: Radial 100kg, Axial 80kg. 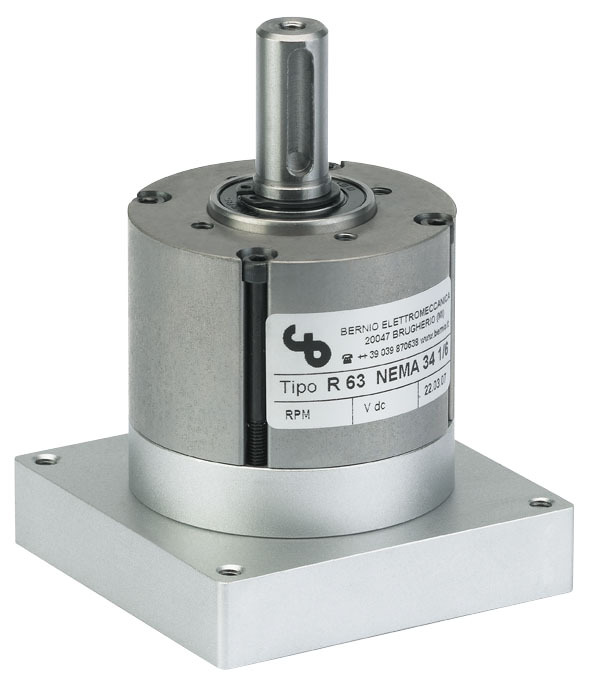 Epicicloidal reduction gearbox R 30 Q Nema 17 has a galvanized steel frame and delrin, hardned steel and sterizzed steel gear; 2 ball bearings support outlet shaft. Gearbox R 30 Q Nema 17 permanent greasing. Gearbox R 30 Q Nema 17 may be joined with Nema 17 motor. Normaly the gearboxes model RHP 42 are produced in the standard dimenson. But it's possible to make different meccanical dimension of gearboxe model RHP 42 . 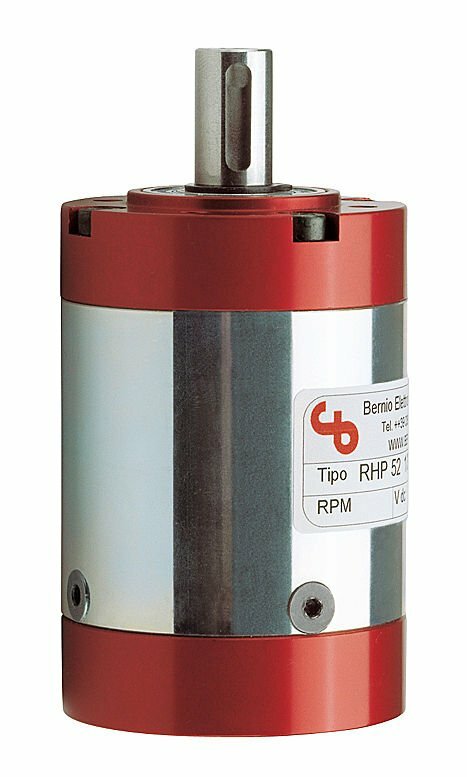 RHP 42 motor shaft can be max 6mm, and connecting diameter 25 mm. Different ratio of gearboxe till to 614,25 on request. Epicicloidal reduction gearbox with a frame, delrin and gear of sterized steel; outlet shaft supported with 2 ball bearings with max speed 4000 RPM at the reduction gear, but advised speed 3000 RPM. 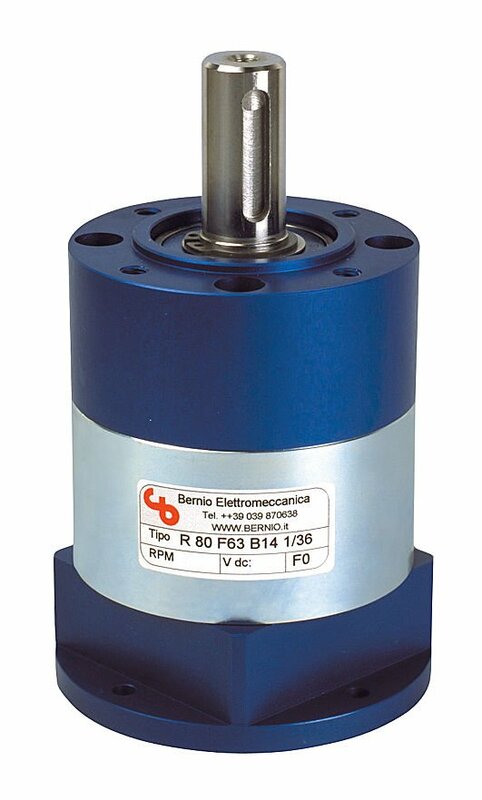 R 63 gearmotor may be joined with Nema 23 motor with shaft diameter 6 or 6,35x21. Max forces: Radial 50 kg, Axial 40 kg. 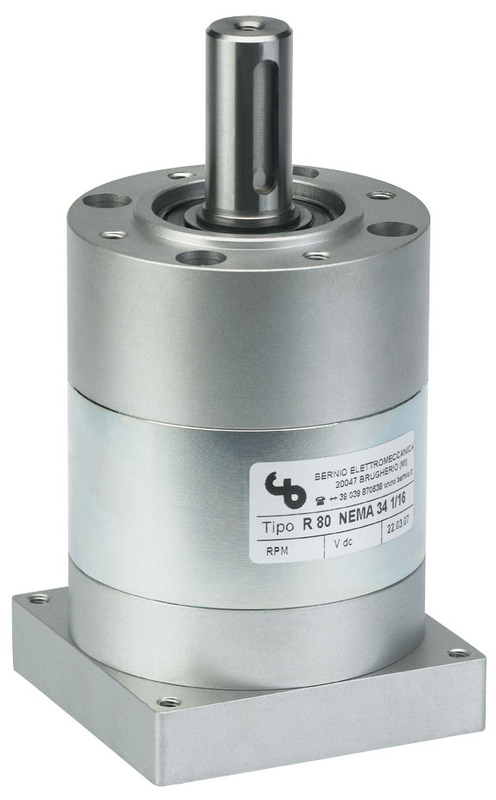 Epicicloidal reduction gearbox R 63 Nema 34 has a galvanized steel frame and delrin, hardned and sterizzed steel gear; two ball bearings support outlet shaft. Speed at the reduction gear 4000RPM (maximal), and advised speed 3000RPM. Can be connected to Nema 34 motor. Shaft diameters 8, 9.52 and 10x31 for nema 34. Forces: Axial 40 kg Radial 50 kg. 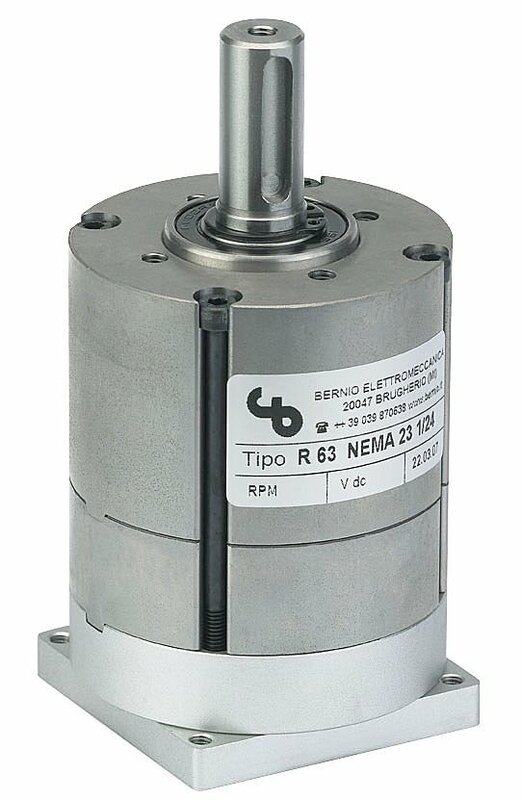 Epicicloidal reduction gearbox R 80 Nema 34 has a galvanized steel frame alluminium brass and flange, hardned and sterizzed steel gear; two ball bearings support outlet shaft. Speed at the reduction gear 4000RPM (maximal), and advised speed 3000RPM. Forces: Axial 50 kg Radial 60 kg. 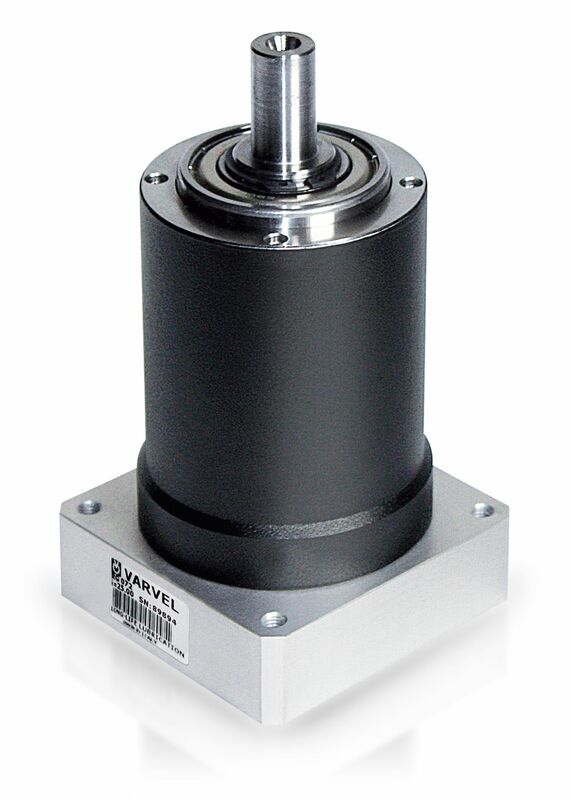 Main use: brushless, stepper and dc motor drives. Manufacturing: 1 and 2 stages, 4 sizes. 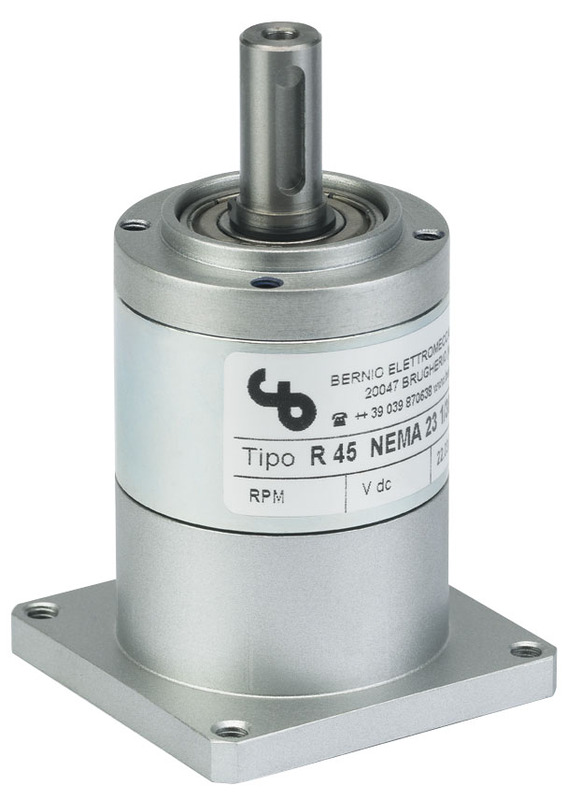 Epicicloidal reduction gearbox Model: R 45 Nema 23 has a galvanized steel frame, steel delrin, sterizzed and hardned steel gear; two ball bearings support outlet shaft. Speed at the reduction gear 5000RPM (maximal), but advised speed 3000RPM. Max forces:30kg-Axial, 40 kg-Radial of outlet shaft. Normaly the gear boxes are shiped in the standard (normal) dimenson like the drow. Precision gear box possible to have different meccanical dimension with the following description. Motor shaft of Model: RHP 52 8mm (max). Conecting diameter up to 42mm. Different ratio of Precision gear box till to 614,25 on request.